With the Super City approaching its sixth year and Aucklanders about to go through their third elections for the unitary Auckland Council, how is South Auckland faring? The new Auckland Council earmarked two areas for regeneration: the central city; and Manukau, in a project called the Southern Initiative (TSI). The Southern Initiative covers the Māngere-Ōtāhuhu, Otara-Papatoetoe, Manurewa and Papakura Local Board areas, but not the more southern Papakura or Franklin. A recent survey of residents on the Council’s reputation was revealing. 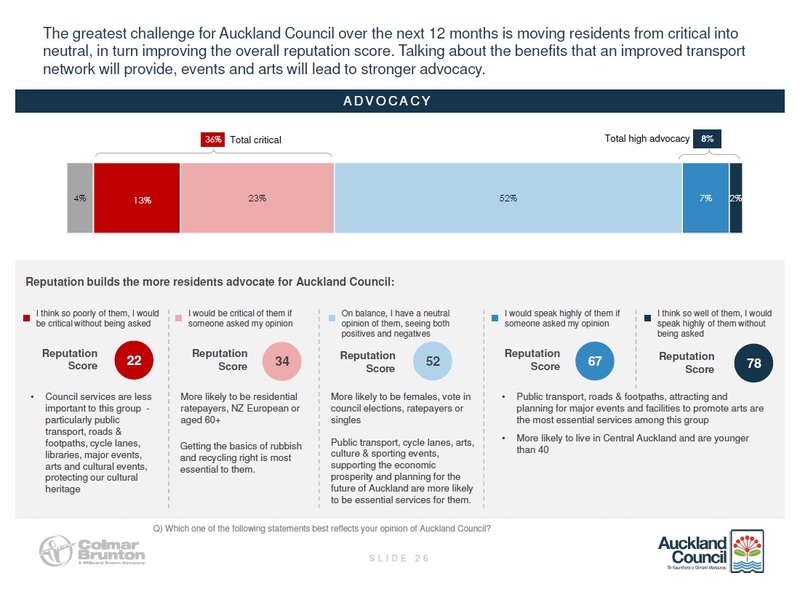 Results are reported in ‘Measuring Auckland Council’s Trust and reputation’, which is a summary of the March 2016 Auckland Council commissioned Colmar Brunton ‘Citizens Insights Monitor’. 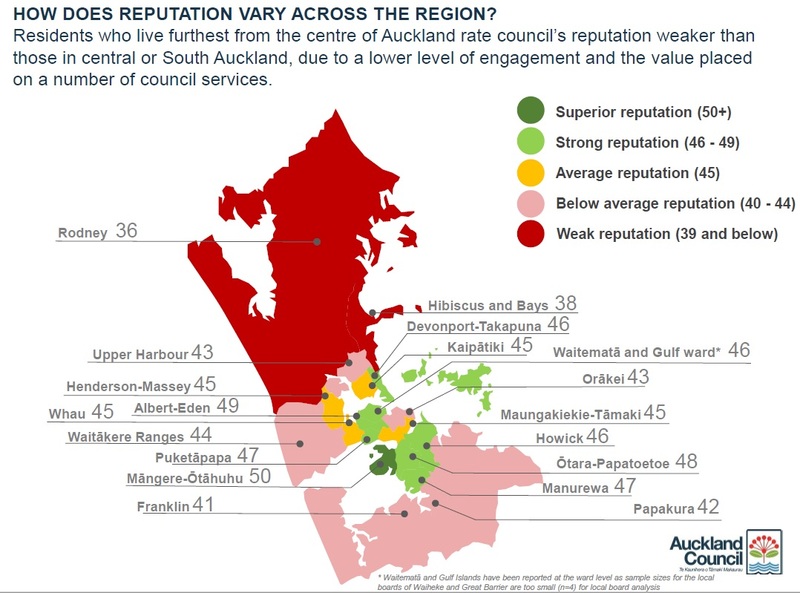 The Council’s reputation score was only of 45 out of 100, indicating low trust and reputation with Aucklanders. The more outlying areas of the region – Rodney, Hibiscus and Bays in the north and Papakura and Franklin in the south­ – scored the Council most low – while other areas – including Māngere-Ōtāhuhu, Otara-Papatoetoe and Manurewa – were more favourable than average (but scores were still low). I have lived in South Auckland for most of my life, and in the Papakura Local Board area with my young family since 2012. Papakura is at the southern end of the main Auckland urban area and is connected to the rest of the city by the Southern (rail) line, the Southern motorway and the Great South Road. With the proposed Auckland Unitary Plan recently passed (August 2016), the Papakura Local Board area and its neighbour the Franklin Ward face the brunt of urban growth. This means pressures on the already strained transport network and existing community amenities, which are not in great shape to start with. Those amenities include the run down Papakura Metropolitan Centre, shunned by locals in favour of places like Takanini Village further north. While the Papakura Local Board was fractured and had leadership changes mid-way during its first term (2010-2013), from my personal experience the second term (2013-2016) has been more constructive. The Local Board, and Ward Councillor Calum Penrose, have advocated on transport and amenity improvements. Things are starting to lift in Papakura – although possibly not fast enough given the high population growth in the area. Despite its urban growth, the Papakura area does not see the same level of investments as Manukau. Sure, the Southern Motorway is being upgraded between Manukau and Papakura but local improvements to the Great South Road to allow busses to travel down it more efficiently, and the Takanini Station, are extremely slow in coming. In the end the Papakura Local Board can only do as much as their small budget allows and if the main Governing Body and the Council Control Organisations – such as Auckland Transport and Panuku Development Auckland – are not willing to commit resources, not much will get done in an area facing population pressures. In terms of budget The 2016/2017 Annual Plan has allocated for the Papakura Local Board $2,839,000 for capital expenditure (p. 187). The Local Board is planning to spend $8,000 more – creating a budget deficit – to either invest in new assets or renew existing ones (p. 187). The Governing Body of Auckland Council in the 2015-2025 Long Term Plan had also allocated $10m per year across all 21 Local Boards for discretionary capital expenditure funding (often in the Local Driven Initiatives budget line) for which Papakura has $648,000 (p. 191) this current Annual Plan year. That allocation is being expended on things like speed tables on Arimu Road (estimated at $146,000 as of July 1, 2016) and a sheltered walkway between Papakura Station and Papakura Metropolitan Centre. Meanwhile the same Annual Plan has allocated the Otara-Papatoetoe Local Board $3,814,000 for capital expenditure (p. 174), and the Board is planning to spend an extra $112,000 in the same period (again creating a budget deficit). With the Local Driven Initiatives (the discretionary fund), the Otara-Papatoetoe Local Board plans to spend $164,000 (p. 178) while using $2.9m ($2.1m in Papakura) of its main capital expenditure allocation on asset renewals. Otara-Papatoetoe Local Board’s discretionary expenditure might seem low – it has none allocated to Manukau City Centre – but when the Council CCO Panuku Development Auckland is to commit $72m of initial investment in Manukau City Centre area in the Otara-Papatoetoe Local Board area, you could see how central Council investments dwarf Local Board investments in the surrounding areas. The budget allocations to Local Boards to fund local initiatives will have an influence on reputation scores. Papakura is one of the fastest growing areas but has one of the lowest Capital Expenditure allocations; it rated the Super City below average (42/100). Meanwhile the Manukau Ward (covering Māngere-Ōtāhuhu, Otara-Papatoetoe Local Boards) – while also a fast growing – also has a larger Capital Expenditure allocation and had some of the highest scores (48 and 50) in favour of the Super City. This is while Manukau ward contains some of the highest social deprivation in the Super City region and some of the lowest voting rates. The fact Mayor Len Brown is a former Mayor of Manukau City Council may contribute towards Manukau feeling positive towards Auckland Council; but the Otara-Papatoetoe Local Board has become the centre of attention for investment by central Council forces more so than other Local Boards (except Waitemata which has the main City Centre). How much does this investment contribute to positive feelings towards Auckland Council? Southern Initiative investments include new bus/train interchanges at Ōtāhuhu and Manukau City Centre, the new South Auckland bus network that was received well by South Auckland due to start in October 2016, new cycleway infrastructure in Māngere, a new pool and leisure centre in Ōtāhuhu and the massive Transform Manukau programme led by Panuku Development Auckland ($72m of Council investment). There is also other investment from Central Government (600 houses via Housing New Zealand) and the private sector. You cannot say things are not happening in the South. While the Manukau ward Councillors and the two Local Boards inside the Ward have been advocates for their area, the contrast with Papakura shows the importance of the superior budgets of the Governing Body of Auckland Council (as the Transform Manukau experience I went through would attest to) and its Council Controlled Organisations. 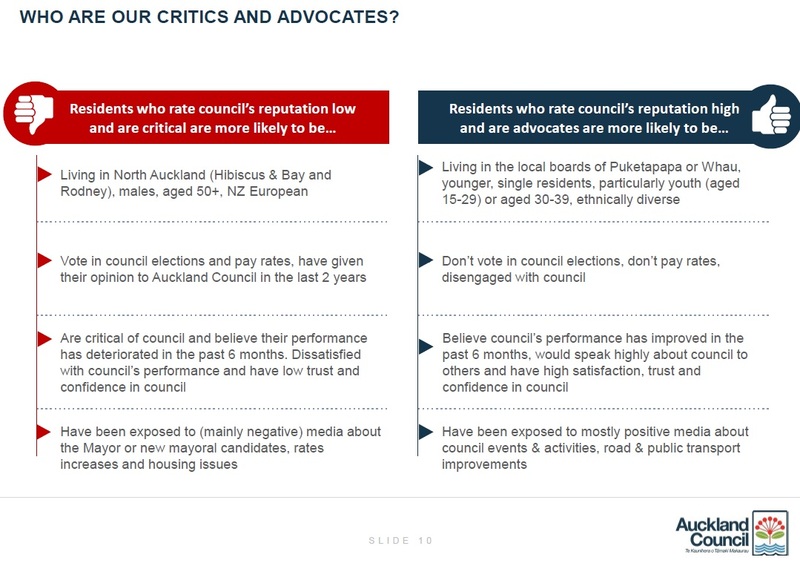 In concluding remarks, the experience for South Auckland with the Super City and Auckland Council has been mixed if you look at the ‘Measuring Auckland Council’s Trust and Reputation 2016’ report. In Papakura the experience is negative with the high population growth and perceptions Auckland Council is not investing enough especially in transport. With the Manukau Ward having the Mayor from your area as well as increased Council investment impacts perception more positively. Ultimately the Council needs to spread its level of enthusiasm of investment seen in Manukau towards the more outlying Papakura, Franklin and Rodney if Council’s reputation score is to be lifted from 45/100. South Auckland is the home of Ben (and his young family alongside Rebekka) and has been for most of his life. Despite its negative stereotypes South Auckland is a sub-region Ben has admiration for. He admires South Auckland for both its physical geography and for its social and cultural diversity. 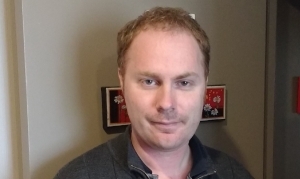 Ben is a passionate advocate for South Auckland with commentary and analysis pieces often fostering discussions and action boosting the South. This commentary has gone noticed and picked up mentions ranging from the Deputy Mayor to Russell Brown at Public Address, to youth organisation Generation Zero. His advocacy has led to the resulting Transform Manukau program led by Panuku Development Auckland, advocacy that was recognised by the Governing Body of Auckland Council in 2016. Ben is standing for election to the Papakura Local Board in the 2017 Auckland Council elections.